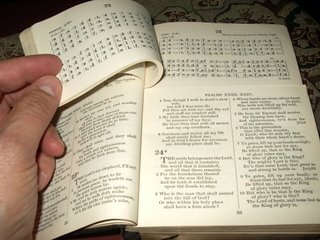 Recently I received a 1929 Scottish Psalter: Metrical Version and Scripture Paraphrases, With Tunes through Abebooks. It was shipped from a bookseller in Scotland. It's the split-leaf version. The Psalter part is split-leaf. On the bottom of the "dutch door" you'll find the words for all 150 Psalms. The top of the "dutch door" has the melodies. Most Scottish Psalms can be sung to many different melodies. The minister will call for the singing of a Psalm to a specific melody. The worshippers will then flip the "dutch doors" to get to the right Psalm and the right melody. Another interesting feature is that the music is not set in notes but in do-re-mi, etc., fashion. Do they give psalter-lessons like we give catechism, just so they all know how to use this book? It looks complicated, especially the music. As someone who can't read music, I rely on the notes to tell me whether I should go up or down...that psalter looks too difficult. Yes, I think it would take a bit to get used to it. The unfortunate thing is that every psalm has exactly the same meter so that every psalm can be sung to every tune, right? And, if this is the book I'm thinking of, all of them can be sung to the theme music of Gilligan's Island (as, for that matter, can "Amazing Grace").